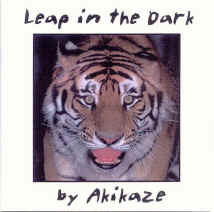 Akikaze, Japanese for autumn wind, is the musical exploration of Pepijn Courant. As a child, I used to listen to all kinds of music. I mainly studied classical music, but also modern music such as by Béla Bartók. My seven year piano training was to have a big influence on my way of composing. I use a lot of instruments: synthesizers, keyboards, samplers, effect processors, electronic drums, hardware sequencers, guitars, santoor and acoustic percussion. I own a few wind instruments, some of which I tried and played or sampled on early albums.